When one thinks of the phrase "CaoDai," they will associate it with a political group involved in protest of French rule in Vietnam, if they have ever heard of it at all. In actuality, while CaoDaiists did play a part in these protests, CaoDai is a primarily indigenous Vietnamese religion that encompasses many other world religions but is also extraordinarily unique in its belief system and practices. CaoDai was officially founded through a medium session 1926 by Ngo Van Chieu (a.k.a. Ngo Minh Chieu), an official of the French colonial administration that was widely read in both Eastern and Western religion with a particular interest in spiritism (Ellwood). One of the main points of CaoDaiism can be seen as early as this point in its history: it is a religion not founded by a man like Islam, Christianity, and Buddhism were, but rather by God (Dai Dao) himself. In the past, God has sent His message via prophets and messengers. He sent His word to Muhammad through the angel Gabriel. Before that he gave the world his son Jesus Christ who had a direct communication with God. And after attaining "supreme enlightenment" Sidhartha Sakyamuni (today known as "the" Buddha) gave man the Dharma he could not conceive before (Do 15). However, God saw the violence and hatred throughout the world that not only was not solved by religions founded by people he had sent a message to, but actually because of these religion. This did not sit well with God. Formerly, people lacked transportation and therefore did not know each other. I then founded at different epochs and in different areas, five branches of the Great Way: Religion of Humanity, Geniism, Christianity, Taoism and Buddhism, each based on the customs of the race. In present days, transportation has ben improved, and people have come to know each other better. But people do not always live in harmony because of the very multiplicity of those religions. That is why I have decided to unite all those religions into ONE to bring them to the primordial unity. Moreover, the Holy Doctrine has been, through centuries more and more denatured by the people responsible for spreading it, I have been suffering seeing that human beings for almost ten thousand years have been committing crimes and spending their life in Hell for ever. I have now firmly resolved to come Myself to show you the Way (Anonymous). Just over five years before, Chieu was laying on his hammock when a huge eye appeared in front of him, just a few meters away. It shined like the sun and was surrounded by a halo. Chieu was frightened and attempted to cover his eyes, yet he could still feel the Eye's glare. The glare intensified, frightening him more. Chieu had previously chosen a cross to represent Duc Cao Dai, but God said that a cross had already been used (by Christians). A week later, Chieu found himself in this state of fear as God helped show him what should be worshiped as God. As the light grew brighter, Chieu prayed to God, "If you want me to use this as a symbol to worship you, please let it vanish immediately." The light faded and surprisingly, Chieu was not convinced that this was the Divine Eye. However, two days later this scenario replayed itself. 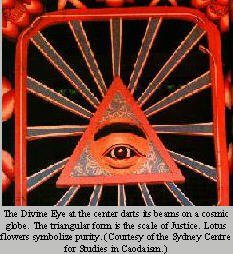 Chieu was then convinced that this was the symbol God wanted to represent him: the Divine, All-Seeing Eye. It seemed strange to Vietnamese at first, but then they accepted, because after all, if God wasn't a man, what better way to represent his Universal Salvation (Do 16-20). The question should be raised here, is Chieu a prophet? Do CaiDaiists worship him as Christians do Jesus? Certainly not, taking into account what CaoDaiism calls the "Three Revelatory Periods." The First Revelation is also called the Era of "Creation" or "Innocence." During this time, there was peace. When man was hungry, he ate; when thirsty, he drank -- nothing more (Do 22). When man began to lose his natural goodness, God sent down Moses (Christianity, Judaism, Dipankara Buddha (Buddhism), Thai Truong Dao To (Taoism), and Fu Hsi (Geniism). Greed continued to attack the soul of man, dragging him into the next era. The Era of "Progress," "Wars," or "Self-Destruction" was next, bringing about the Second Revelation. "Every man did what was right in his own eyes" (Do 23), causing utter chaos and evil. God revealed himself this time to Sakyamuni Buddha (Buddhism), Lao-Tzu (Taoism), Jesus Christ (Christianity), Muhammad (Islam), Khuong Thai Cuang (Geniism), and Confucius (Confucianism). While handfuls of people followed these prophets' teachings, the majority of the world went their own way towards utter moral and spiritual collapse. Humanity was suffering from all kinds of vicissitudes. I sent Allen Kardec. I sent Flammarion, as I also sent Elijah and John the Baptist, precursors of the advent of Jesus Christ. One was persecuted, the other killed. Who did it? Humanity. Even My Son was killed by you; you worship Him in spirit but not in holiness. I wanted to just once during Moses' day on Mount Sinai, but you could not understand Me. The promise I made to your ancestors for your redemption, the advent of Christ, was prophesied but you did not care to listen. Now I must make use of a greater spiritual agency in order to convince you (Do 27-28). The fact that God is revealing himself directly to humanity is a very unique aspect of CaoDaiism: through very solemn and ritualistic preparation, a select few can become participants at medium sessions. Another question arises from this: if God knew it was time to speak directly to humanity, why did he choose to do it in South Vietnam rather than in the middle of China, India, or America? Mr. Tran Quang Canh, Chan-Tri-Su (Sub-dignitary) of the Washington, D.C. CaoDai congregation, the reason was the unusual acceptance of religion in Vietnam through the years. "Through God's message, even though it is a small country, the Vietnamese people, throughout the centuries, acknowledged, accepted and practised all religions that came to Viet Nam, without any discrimination," Canh said. "God chose Viet Nam to start His new religion as a reward" (Canh). The major world religions have generally been revealed in China, India, and the Middle East. CaoDaiism's roots in South Vietnam combined with its directness with God makes it an extremely unique religion. However, a main theme in CaoDaiism is that all religions are one. This is a strong tie that binds CaoDaiism to all the other religions that God has revealed. From a moral standpoint, CaoDai "reminds people of their duties towards themselves, their family, their society (a broader family), then toward humanity (the universal family)." From a philosophical point of view, CaoDai renounces wealth and riches as paths to true spiritual fulfillment. From the point of view of worship, CaoDai recommends "the adoration of God, the veneration of Superior Spirits and the worship of ancestors." Spiritually, CaoDai confirms, in harmony with other religions, the existence of soul beyond the physical body as well as reincarnation according to Karmic law (Dao, "Fundamental Principles..."). For the westerner, the CaoDai religion sounds easy to swallow until they hear of the belief in karma and reincarnation. This is a Hindu idea that pervaded in the later Mahayana and Tibetan schools of Buddhism, all very eastern in origin. As noted above, Chieu was widely read in both western and eastern religions and philosophy. We have seen many of the Western ideals of CaoDai, but there are an equal number of eastern ideals combined into this religion. One of CaiDai's basic principles is the synthesizing of the Doctrines of Buddhism, Taoism, and Confucianism into one. This includes the three main duties(2) and five essential virtues(3) of Confucianism, the three refuges(4) and five prohibitions(5) of Buddhism, and the unification of the three jewels(6) and the five elements(7) of Taoism. It may be this very strict adherence to eastern thought that has kept CaoDai a predominantly Vietnamese religion since its inception over 70 years ago. In fact, CaoDai didn't even reach the United States until the Vietnamese community began to seek refuge from their own country after the Communist take-over in 1975. The highest rates of CaoDaiism in the world still tend to be where there is a largely Vietnamese community (Canh). However, Canh does not necessarily think that it is the eastern thought that is stopping non-Vietnamese acceptance of CaoDai, but rather the lack of books and materials available in English about the religion. The CaoDai community is not worried, though, because "divine messages informed us that the U.S. will spread the CaoDai religion." In God's own words: "When time comes, I will send my representatives to come and take over the mission for propagating the religion." As a spiritist religion, CaoDai believes all to be prophesied beforehand (Canh). Right now, though, there are about 100 CaoDaiist families in the Washington, D.C. area and many more on the west coast (due to immigration). There is no statistic with regards to the Vietnamese CaoDai population in the United States, but Canh estimates it at between 15,000 and 20,000 (Canh). An interesting parallel exists between CaoDaiism and Catholicism. CaoDai has a governing body, the Cuu-Trung-Dai (College of Men), that bears a striking resemblance to that of the Catholic Church. There is one Giao-Tong (Pope) who leads the Cuu Trung Dai executive body. There are three Chuong Phap (Legistlative Cardinals), one belonging to each of the three legislative branches: Nho (Confucianist), Thich (Buddhist), and Dao (Taoist). There are three Dau-Su (Cardinals): again, one for each branch. The Chuong-Phap decide on religious laws before their promulgation whereas the Dau-Su "have the right to direct the Disciples of God, spiritually and temporally" and also have a right to enact laws, but they must be submitted for the approval of the Pope. There are 36 Phoi-Su (Archbishops), 12 for each branch, with three Chanh Phoi-Su (Principle Archbishops). These are the next in the line of command and power. There are 72 Giao-Su (Bishops), 24 for each branch, responsible for education of the disciples. The 3000 Giao-Huu (Priests) are also split evenly among the branches, presiding over ritual ceremonies in the province temples. The Giao-Huu are in charge of propagating the Religion. There are an unlimited amount of Le-Sanh (Student Priests). They are drawn from the most virtuous of the Sub-dignitaries. There are also an unlimited number of Chuc Viec. The Chanh-Tri-Su (Minor Office-Bearers) look after the adepts in the villages. There are also Pho-Tri-Su (Sub-dignitaries) and Thong-Su (Religious Village Administrators). Finally, there are an unlimited number of Tin-Do (adepts), or followers of CaoDai. Female dignitaries may reach the rank of Cardinal only. There is a College of Women that was instated by Spiritual Pop Li Tai Pai (Dao, "Structure of..."). Though CaoDai is a baby in respect to the religions it encompasses, it is a very organized and planned religion with many other laws, offices, and divisions included. To discuss them here would take a large amount of space. Now that the general hierarchy and belief system has been discussed, we must look at that it takes to be a typical Tin-Do (adept, follower). There are two orders of CaoDai believers. First is the secular order. This order consists of non-married and married people who earn their living as "ordinary" folks. Their religious duties consist of a few different practices. First, they must observe a vegetarian diet of six days a month for the first six months after they become a believer. After that, each month they must do this ten days. They must also follow the Five Prohibitions mentioned earlier (which parallel Christianity's Ten Commandments in half the space) (Dao, "Practising..."). The second order is the Thuong Thua (Superior Order). This order ranges from simple believers to dignitaries of the Giao-Huu (priestly) ranking. To become a member of the Superior Order, they must have practiced full-time vegetarianism (which is used as a spiritual cleansing and for reincarnation-related reasons as in Hinduism). They must also not have their beard or hair cut and wear only ordinary, plain colored garments (either white or the color relating to their branch). Similar to Catholic priests, a vow of chastity must be made and members must be thrifty, avoiding luxuries. They also must follow the Tu Dai Dieu Qui (Four Great Commandments), which consists of obeying/respecting superiors, acting with humbleness, being precise in matters of money, and being sincere at all times. Members of the Superior Order can enter the Tinh-That (House of Meditation) to receive esoteric training provided they follow a set of eight regulations (having fulfilled moral and social obligations, etc.) and once inside they may not talk to the outside world (aside from close family) or engage in any eating or activities outside of what they are allowed (Dao, "Practising..."). CaoDaiists have another interesting practice. They record a person's birth date, but not their death. CaoDai teaches, as other religions do, but apparently with more success than these others, that death is just a continuation of life. What is notable, though, is that there is a prescribed course of action for funerals and mourning periods for families, allowing for sadness and a feeling of loss. While this might seem hypocritical, one only has to remember that Christianity teaches the same idea, of "going to a better place," but death is perhaps the most feared experience among Christians and having to face it universally brings about sadness and mourning. For CaoDaiists, though, the most frightening thought is that of losing one's soul (Do 29). In the Era of Annihilation, CaoDaiists are concerned not necessarily that they will lose their physical bodies, but that their spiritual bodies will be gone forever because of the direction God says humanity has been heading. So, we must do our best to enlighten ourselves and teach others through positive living. The two words that are part of the CaoDai doctrine that can best sum up the religion is: "Love immensely." But, then, what is the connection of CaoDai the religion and CaoDai the political force? Although they began as purely religious institutions, the strength of Vietnamese nationalism was such that both the CaoDai and the Hoa Hao quickly took on political coloration. They mixed anti-colonialism with religious tenets, cooperated with the Japanese during the wartime occupation in order to obtain protection from the French, and joined with the Viet Minh in resisting the return of French troops to Cochinchina at the war's end (Scigliano 18-19). Soon, though, the pair found that alignment with the Viet Minh was going to pose a worse threat than living with the French, and by 1947 most of the members of the alliance decided to go to the French in return for arms and other help (Scigliano 19). As time passed, the CaoDai and Hoa Hao let the French know that though the aligned with them for a while, they did not approve of their plan to separate Cochinchina from the rest of Vietnam. One French writer referred to this fiery religious alliance as having "a nationalist spirit pushed to the extreme" (Scigliano 19). This alliance continued on until January 1956 when South Vietnamese Army units occupied Tay Ninh, a principal CaoDai political center, which lead to the break up of the organized CaoDai armed sect (Raskin 381). The Caodaist is at first a Vietnamese citizen, which means that he/she is concerned about the welfare of the country firsthand. That's why we see that our leaders did get involved in the struggle for independence (from France colonialization) with the rest of the nation. Also, at the time, the French in the beginning, and the Communists later, they all wanted to exterminated the Caodaists because they feared that the latter, with the mass population behind, presented an obstacle to their authority and goals. Nevertheless, involving in political activities in order to survive does not mean to disregard or lessen the religious practices and beliefs of CaoDai. Exactly, CaoDai plays a big part in the overthrow of the French government to claim independence, but disbands right away its army after that, to return to its main religious activities (Canh). It seems normal that the average person would remember CaoDai from their involvement in the political struggle for independence. However, if this religion was not so inherently strong and determined for universal freedom and rights, their involvement in the political struggle would have been nonexistent. This strength comes from a powerful faith in God and his divine messages delivered to the world throughout the Three Eras. The combining of western and eastern religions and thought makes it one of the most provokingly interesting religions of the world, and at the same time makes it also one of the most accessible and universal. Anonymous. "VietInfo: Welcome to CaoDaism!" Cao Dai: A Novel Religion. http://www.vietinfo.com/non_profit/religion/caodai/caodaism.html (10 Apr. 1997). Canh, Tran Quang <Canh.Tran@ha.osd.mil>. Personal interview via e-mail. 9 Apr. 1997. Dao, Cong-Tam and Tran Quang Canh. "Fundamental Principles of Caodaiism," "Structure of Caodaiism," "Pracitising Caodaiism." Sydney Centre for Studies in Caodaiism. http://www.library.usyd.edu.au/~tdao/tam.htm (10 Apr. 1997). Ellwood, Robert S.; Edited by Mircea Eliade, et al. "Cao Dai." The Encyclopedia of Religion. U.S.A. 1987. Raskin, Marcus G. and Bernard B. Fall. The Viet-Nam Reader: Articles and Documents on American Foreign Policy and the Viet-Nam Crisis. New York: Random House, 1965. Scigliano, Robert. South Vietnam: Nation Under Stress. Boston: Houghton Mifflin Company, 1964. Canh, Tran Quang. "Caodaiism in the Washington Metro Area" http://www.vietinfo.com/non_profit/religion/caodai/caodaism.html (3 Apr. 1997). Phap, Chanh Truyen. "Cao Dai Constitution." Sydney Centre for Studies in Caodaiism. http://www.library.usyd.edu.au/~tdao/phapct.htm (3 Apr. 1997). 1. The basket with the beak technique refers to a mechanical device used in Spiritism medium sessions (similar to the way a Ouija board might be used). It is a 26-inch long stick with a carving of a phoenix head on one end and is covered on the other end by a latticed bamboo basket. Two mediums hold the stick and an interpreter stands next to one of the medium and reads the messages to a secretary who writes them down (3). 2. (Tam-Cang): social relationships between king and subject (quan-than cang), feather and children (phu-tu cang), and husband and wife (phu-the cang) (Dao, "Fundamental Principles"). 3. Love/Humanity (Nhon), Justice/Faithfulness (Nghia), Good behavior/Politeness (Le), Wisdom (Tri), and Loyalty (Tin) (Dao, "Fundamental Principles"). 4. (Tam Qui): to take refuge in the Buddha (Qui Y Phat), to take refuge in His Law/Dharma (Qui Y Phap), and to take refuge in the Spiritual Community (Qui Y Tang) (Dao, "Fundamental Principles"). 5. Do not kill living beings (sat sanh), do not steal (du dao), do not commit adulter (ta dam), abstain from drinking intoxicants (tuu nhuc), and do not sin by words (vong ngu) (Fundmental Principles). These are also listed as the "Five Interdictions" in Cannon IV, Article XXI of the Sacerdotal Law of the New Cannon of Cao Daiism (Do 63-65). 6. (Tam buu): life matter/ching (tinh), life energy/chi (khi), and soul/shen (than) (Dao, Fundamental Principles"). 7. Mineral (kim), vegetable/wood (moc), water (thuy), fire (hoa), and earth (tho) (Dao, "Fundamental Principles").